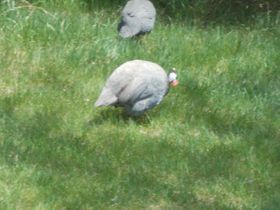 We first obtained guinea fowl to eat grasshoppers and protect our garden and orchard. Living next door to large fields and pastures, it only takes a summer wind to bring large grasshoppers into the green of our country home. Our guineas and chickens work hard hunting grasshoppers, ticks and other pests. There are more photos in our photos section. 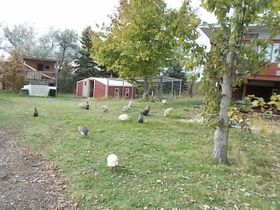 Guinea hens will lay their eggs anywhere - and more than likely - NOT in the coop if they have a chance to roam. When the hens go broody, they'll stay on their nest all night, but their mates will generally come back to the coop. Since predators often attack at night, they tend to kill the female guineas, but the males remain safe. Over time, guinea flocks tend to have a lot more males. If you're just interested in tick and grasshopper control - try a flock of only males. 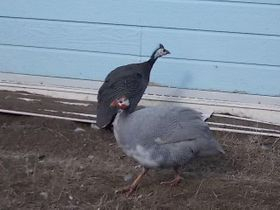 We love our guineas and have both common and rare colored birds. These birds are relatively tame - for a guinea - and used to coming into a coop at night. Just give them a few days locked up in their new housing so they can imprint on that space, then make sure you have a light on inside the building to encourage them to come to the coop. If you coop your guineas at night, you should avoid most losses by predators. I should have day old keets (babies) available later this summer and fall. Those hatches will likely include some of the more rare colors. There's a pearl guinea (black with white dots) in the back and a lavender pied in the front. Here's one of our bronze hens walking through the yard. A lavender guinea is in the back. A large, slate male is in the front. 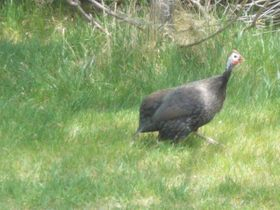 Our birds roam free on the property, eating ticks, grasshoppers and other bugs. They also graze. The guineas are enjoying their first taste of homegrown barley fodder in January, 2015. 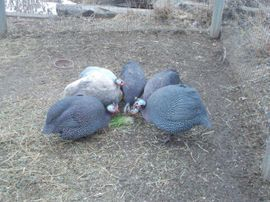 The guineas and chickens live together. Coop windows open into a pen.